This free-to-play 3D endless digger pays homage to the classic arcade games Mr. Driller and Dig Dug. 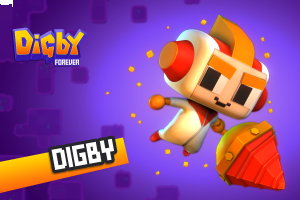 Although Digby Forever takes elements from both of those retro games it is not just a copy that has been brought to mobile. The objective is to dig as far as can while collecting crystals and gems to convert into in-game coins. The game is available free on iOS.